A deck is an extension of your home, giving you more space to do the things you love. When they’re carefully designed and installed by a skilled home improvement contractor, this structure can open up the possibilities for your outdoor space, making your home a favorite hangout spot for friends and family. If you’re thinking of adding a deck to your home, there are many opportunities in store for you. Your deck is the perfect place to relax on a nice summer evening. Whether you want a little time to unwind, kick back with your favorite book, or just enjoy the pleasant weather, a well-designed deck is a home improvement project you won’t regret. If you like having family and friends over for a barbecue or hosting neighborhood parties, your deck will quickly become your social circle’s go-to place of gathering. With built-in amenities and furniture, the space is also ideal for special events like birthday celebrations and even wedding receptions. 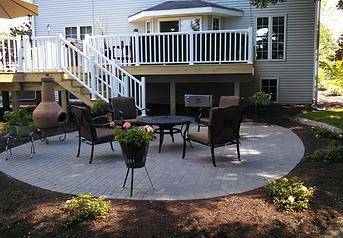 When completed by an experienced contractor, your deck will maximize your outdoor living space. Enjoy dinner in your backyard at a built-in table, watch your children play in the yard as you relax, and even build an entertainment center complete with a television and video game consoles to keep the fun going. A commitment to quality and a broad range of services has made New Leaf Remodeling in Rockford, IL, one of the area’s premier contractors, with a long-standing reputation for going above and beyond. Visit their website now to see examples of decks they’ve built, follow their Facebook for design ideas and updates, or call (815) 904-6006 to discuss your home improvement project and turn over a new leaf today!